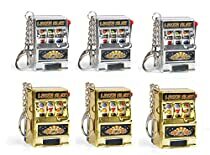 Bulk Set of 6 Miniature Slot Machine Keychains. Comes in 3 Gold and 3 Silver. Slots really rotate! Great for Party Favors or Giveaways! Mini Slot Machines Measure 2″H x 1.25″W x 1″D. Small enough to fit in your pocket along with your keys! Must-have for casino lovers!